Worldwide internet advertising (Google Adwords, for example) spending will overtake newspaper expenditures next year (USD $101.5 billion vs. $93.2 billion), and will exceed the combined total of newspapers and magazines in 2015 ($132.4 billion vs. $131.7 billion) in a new forecast. That equates to almost 1 in 4 ad dollars being spent globally on the internet in 2015, second only to TV (40%). That is a huge shift in marketing and rightly so. With online marketing, and in this instance internet advertising, it is possible to pin point your marketing budget to the customer who you want to see your advert; in the right town at the right time and even when you “know” they are looking for a solution or product via remarketing. You get sound reports showing true return on investment, unlike print or TV advertising. The buzz word for 2012 and 2013 for companies has been mobile marketing. With internet advertising it has been possible for a small fee (cost per click) for businesses to advertise when a possible customer uses their smart phone and searches for a taxi, somewhere to eat or a hotel. So what happens to internet marketing or online marketing as a concept when Google expects to be shipping over 9,000,000 pairs of Google Glass by 2016? For all the hype about Google Glass, not much has been said about how it’s going to change Internet marketing. If you’re an early adopter as a business owner you could be given an open playing field just by staying ahead of these changes in marketing through 2014 – 2016. Google Glasses is something we haven’t really seen before. Do you remember when Motorola launched the first hand held mobile and had to convince people they could walk around and talk to people on the phone? It’s the same deal. For sure there will be plenty of critics ready to slate Google newest bit of hardware but it’s a start. The cell phones we use now have come a long way from the ones in the 1980’s. Forget having information at your fingertips. With Google Glass, you’ve got it at a glance, quite literally. Google Glass responds to voice commands and queries, meaning that users can easily gain results for questions about nearby restaurants or other local establishments. This would provide very little new in terms of search results, but would instead provide a different interface for results, and perhaps more instantaneous searching while on the go. The technology of Google Glass will make it possible to look at a restaurant, check out their rankings, view their menu, find out if there is seating, and maybe even snag a coupon code, all the while dawdling on the sidewalk out front. Google Glass is primed for on-the-spot activity. There’s no hidden agenda here. Google proudly announces that their spectacles will provide “directions right in front of you” for driving, walking, or just knocking about town. 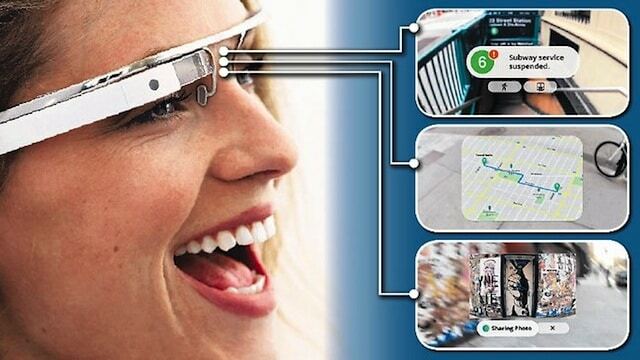 Google Glass will play directly into social networking. One of the main features of the device is taking pictures and videos, and sharing them. Such sharing will provide instant marketing, negative or positive, for whatever establishment or event the user is at. Social reviews will also register on search results, giving users a better perspective on whether they want to patronize a certain business establishment. If you read this article expecting to get to the Google Glass gold rush early, you might be disappointed. There’s not exactly a gold rush going on. Nevertheless, there is some rock-solid advice for how to posture yourself and your business for the unleashing of Google Glass. Stay tuned folks. It pays to keep your ear to the ground about Google trends and developments. What happens in the Googleplex is crucial to your marketing future. As much as we may dislike it, we rely on Google for a lot. When they flinch, we scramble. That’s all there is to it. Keep your Google+ profile robust and active. One obvious trend that will impact all things search related is Google+, along with authorship and Author Rank. Stay plugged in to it. Google+/Local results will be immediately accessible to Google Glass, meaning that you want to get in on those searches. If you’re a local company, focus in on local search results and social media. Google Glass is a geospecific marketing tool. Don’t get left behind. Furthermore, there is talk of other social sites like Twitter amping up their efforts to get in on the Google Glass action. Google Glass is going to be here in very soon. Google Glass will probably be around for a while. Somehow, some way, Google Glass and Internet marketing are going to meet up for a magical connection. You want to be ready.